Randy Phillips, Shawn Craig and Dan Dean have been working hard for more than 13 years, turning up regularly to prove themselves faithful through a musical ministry that has won them scores of faithful fans-not to mention 18 No. 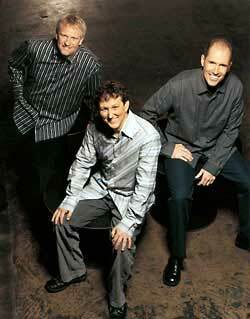 1 singles, several Dove Award nominations and sales near the 2 million mark. Known for their ability to write songs the church loves to sing (including "Mercy Came Running" and "Crucified With Christ"), this trio brings an experience and maturity to today's modern worship movement, enhanced no doubt by their "day jobs" as pastors. The past two releases from the group have been worship focused and this CD marks the third installment of the trilogy, making this their tenth project. Let the Worshippers Arise is due in stores Sept. 28 and finds Phillips Craig & Dean continuing to deliver vertical worship that, above all else, seeks to connect Christians with their Creator. While Phillips, Craig & Dean have proven themselves consistent through the years, there is also much that's new in the life of this timeless group. Most exciting is their move to INO Records, where they again find themselves teamed with label Founder and President Jeff Moseley. "We began with Jeff 14 years ago at StarSong Records," Phillips explains. "He was instrumental in signing us when we were unknown. Jeff is the one who saw a future and we've never forgotten it." There's also a freshness these days to their sound, something they credit in part to producer Nathan Nockels, who has been with them throughout the entire worship trilogy. "We come from a real traditional 'get your part and belt it out' kind of mindset," Craig explains. "Nathan was able to get us to think outside the box." As a result, the new sound is decidedly more upbeat, while at the same time inviting those who hear it to enter into worship along with them. On Let the Worshippers Arise, that updated sound is applied to a mixture of original and familiar songs like "Awake My Soul," which Phillips wrote after being inspired by a revival at his church, and the Matt Redman classic "Making Melody." Another inclusion is a medley that mirrors the 1994 Dove Song of the Year, "In Christ Alone," which was originally penned by member Shawn Craig. In addition, the trio tackles "The Power of the Cross," which Craig wrote with Chris Tomlin, and "Because I'm Forgiven," another Craig composition. "These songs are selected because people can join in with their whole hearts and sing," Phillips says. Adds Dean, "With this type of project, we go in asking, 'How can we draw the audience closer to the presence of God?' We don't want it to be about 'these are great songs,' but 'this is a great God.'"